Nice house with pool for 6 persons, close to the village and the beach. Comfortable house with garden, 3 bedrooms for 6 persons, 3 complete bathrooms. 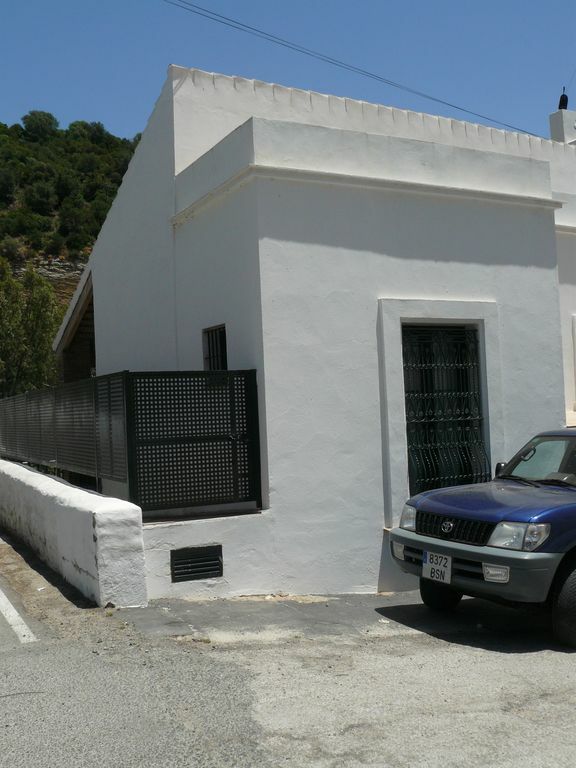 La Casa Chica - Freestanding house in two floors, divided into 3 bedrooms, 3 complete bathrooms, livingroom with TV and chimenea, kitchen, entrance and two terrasses. On the first floor there are 3 bedrooms. The biggest with a doublebed, a 2nd bedroom with a bunkbed and a 3rd that has a bed-sofa that easilly can be extended into a 160cm doublebed. There are 2 bathrooms on this floor and all bedrooms has direct exit to a big terrasse. The groundfloor is divided into an entrance area, kitchen, livingroom and 1 bathroom. The kitchen is fully equiped and there is also a washing machine. From the kitchen and the livingroom you acceed directly to a terrasse with a diningarea. The garden has a pool, a lawn and some fruit trees. The house is equiped with A/C cold/warm, chimenea and heating. There are blankets, sheets and towels except for beech towels. About 3 km´s to the towncentre and 9 km´s to the closest beaches (El Palmar & Barbate) Easy parking. between the two roads to Tarifa and Barbate. On one side of the houses flows the river Barbate and on the other side slopes the hillside to the town. The town is about 1,5 km distance from the house. It´s easy to access by car and it´s also possible to walk (old roman path). Take the N-340 road. Drive direction Vejer de la Frontera, then take the road towards Barbate, the A-393. The houses are situated in the area of La Barca de Vejer close to the old bridge over the Barbate river. Bathroom number 1: Complete bathroom with showercabin. window Bathroom number 2: Complete bathroom with showercabin. window Batroom number 3: Complete bathroom with showercabin. Placed in the bottom floor. La casa es estupenda, muy cómoda y muy bien acondicionada. Es una opción genial para moverse por las playas cercanas y con Vejer a 5 minutos en coche. Aunque está en una zona de paso su situación hace que quede bien asilada del exterior. Alicia muy amable. Volveremos. Es una casa genial con todos los detalles, te hace sentir como en casa, además esta muy bien ubicada a unos 10 minuts de las primeras playas. Gracias por todo Karin y tambien a Alicia por estar pendiente de todo y hacer la estancia muy agradable. Vejer de la Frontera is a charming Andalusian town with typical whitewashed houses, zigzagging streets and beautiful patios where we can find many architectonical influences from the period of Moorish rule in Andalusia. The town has approx. 10000 inhabitants. Vejer is situated on the top of a low hill, 9 km’s from the Atlantic coastline and surrounded by orchards and orange groves. This part of the Coast is called 'Costa de la Luz' because of its intensive light. The area offers a great number of entertaining and interesting activities. Our thoughts go to long, sunny days on extensive Atlantic beaches of fine white sand, in many cases completely unexploited. But of course there are many possibilities to a great variety of activities such as visiting other “white villages”, cycling, bird watching, paragliding, horse riding, whale watching in Tarifa, surfing ect. We can also play golf in the area.